Chalk Hills Academy student Declan Clarke has been selected to watch the England v Italy RBS Six Nations match at Twickenham on Sunday, February 26 as part of the All Schools Program. Declan will be the only student from Chalk Hills Academy attending this once in a lifetime experience where he will unveil the new Chalk Hills Academy’s bespoke rugby shirt designed by Canterbury. The youngster will also be part of the pre-match entertainment, displaying a giant shirt in front of the 82,000 spectators at the game. Declan has been selected as a reward for his excellent attitude and participation in rugby extra-curricular activities and fixtures this academic year. 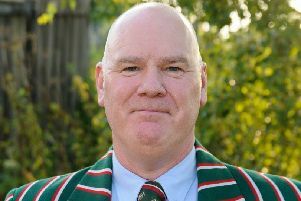 He has been a key part of the development of rugby in the academy, representing the school at all matches and attending rugby club regularly. Declan came to Chalk Hills already playing at Dunstablians RFC and encouraged by his dad, opted to give the sport a try in Year Six. Now in his second full season of playing, he is currently the U13s captain at Dunstablians. Most recently, Declan has been put on a DPP (Developing Player Programme) with Northampton Saints, which is a huge achievement in itself with such a prominent rugby club. England made it two wins from two in the Six Nations by beating Wales 21-16 last weekend thanks to a late try by Elliot Daly which ensured they remained at the top of the table.